This zombie appears to have suffered a run of bad luck. Not only has the Severed Skeletal Zombie Head lost half the skin that covers its face, but it appears to have lost its body, as it is now a gruesome severed head. The bony half of this ghoulish girls face is cracked and chipped, as well as featuring a stained, brown coloration that gives it an aged look. The fleshy half is not much better, though, featuring a ragged, bloody line down the side where the skin has been removed, while the actual skin has a rather unhealthy purple hue. This female zombies mouth and eyes are wide open, as though wailing in agony or preparing to bite a victim. The skin around her neck is tattered and ragged, revealing red tissue underneath, as well as the edges of the spinal column. 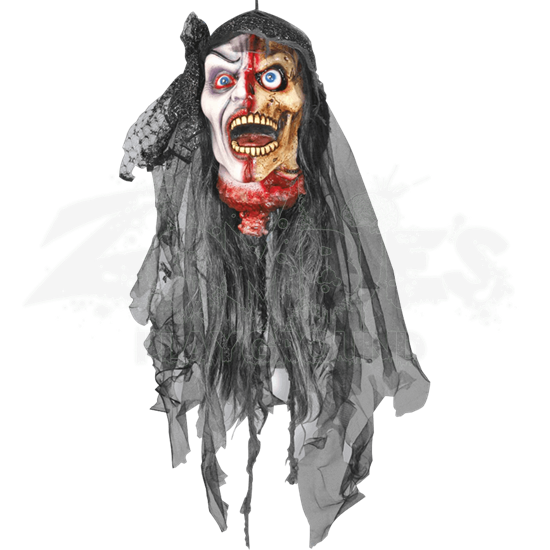 Her head is decorated with a translucent black wrap, which keeps the zombie heads wild, gray hair tamed and controlled. The head features a cord attached to the crown of the skull that allows this gruesome head to be hung as a decoration. The head measures 8 inches tall and 5 inches wide. Visceral and detailed, the Severed Skeletal Zombie Head is a brutal looking decoration that is sure to inspire terror in all those who see it, even though the zombie head should be long dead.